If you watched Gravity, or any other space flick, you’ve undoubtedly noticed that while spacesuits are pretty damn important, they’re also bulky and cumbersome. Sandra Bullock can’t wait to shed hers every time she safely gets into an oxygen-rich environment. I remember seeing an awesome IMAX movie about the Hubble a few years back, in which an astronaut had to do some repairs that involved taking out, and later replacing, 117 screws. With those huge gloves, each turn of the screwdriver was a labor and thought that being an astronaut is perhaps more about achieving a state of zen-like patience than anything else. But in the future, that may not be an issue. In fact, astronauts may soon don space suits that make them look like space-faring sci-fi heroes. Current spacesuits make astronauts look more like the Stay-Puft marshmallow men and women than anything else. With all the talk about colonizing Mars, it’s hard to imagine our Red Planet pioneers efficiently living on the surface, completing hours of manual labor and numerous spacewalks in current suits. 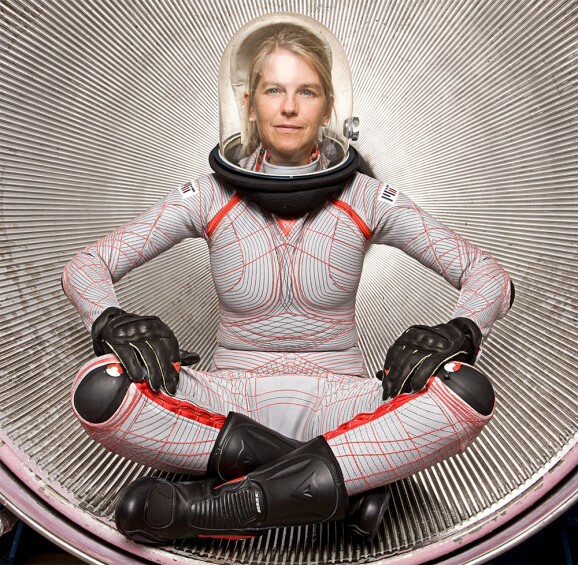 So Dava Newman, a professor from MIT, is working on a design that will facilitate living and working in space, borrowing concepts were first devised as much as 50 or 60 years ago. The first revolutionary detail of the new BioSuit is its skin-tight fit. Instead of the current Extravehicular Mobility Units, which pressurize the suit in much the same way as an airplane cabin, the BioSuit is comprised of about a thousand feet (that’s over 100,000 stitches) of ribbing that delivers counter-pressure mechanically. 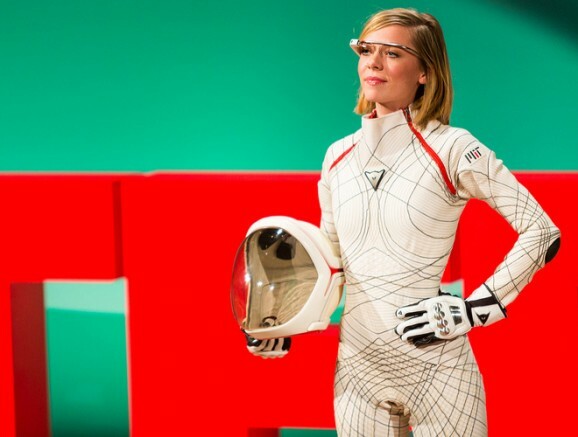 Wearable technology is embedded in the suit, including biometric sensors that gather and send data about the wearer back to mission control. Newman devised the placement of the ribbed stitches by using ideas and mathematical concepts first conceived in the 1882 textbook Lehrbuch der systematischen und topographischen Anatomie, and by second skin concept first introduced by Paul Webb in the late 1960s. The tight fit of the suit allows for greater range of movement and hey, if our astronauts look more like sci-fi characters, isn’t there a chance they’ll feel more like them as well? So how does Newman achieve that perfect fit? 3D printing, of course. In partnership with an Italian company that makes high-end motorcycle and athletic gear, Newman strives to make the suits stylish as well as practical. I could see space tourists wanting to wear these suits too—being in space is awesome, but looking cool in space is even better. That used to be unimaginable—until now. Another benefit to the BioSuit’s design is that it can be patched with something like duct tape if it tears, instead of deflating and killing the wearer. That’s a pretty big plus. The suit’s life support system still needs to undergo testing, especially in terms of its integration with the rest of the suit, before it can be tested in space. Who knows how long that will be, but I bet it’ll be in time for the first round of Mars colonists. I’d like to see more development on this. The bulky old Apollo style suits, little changed in the shuttle era, make efficient work in space impossible. Having a suit that lets you move would be a godsend to expanding mankinds reach in space. The top picture looks more like a CGI that’s in edit mode than something worn by a spacefaring sci-fi hero.